1995card is a cool PC version of Minhato, one of the two Korean card games that use cards from Hanafuda, the popular Japanese "flower card" game. The game is easy to learn, offers tough computer opponents and a neat auto-play mode, which is a good way to learn the basics. If you are not familiar with Minhato, the rules are very easy to pick up - it is very similar to the Western card game "Go Fish!" in many respects, although the special combinations make the gameplay a bit more complicated. Superb high-res EGA graphics and comprehensive on-line help round off one of the best PC versions of this popular card game that is played by over 150 million people worldwide, but is hardly known outside North Asia. Recommended! Note: This download is the registered version that cost $9.95 back when Ninano Software was still alive. 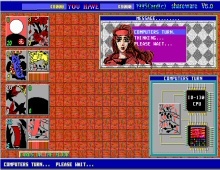 It is perhaps best to uncompress the zip file directly to a floppy disk to install from the floppy drive, since the game uses a copy protection system that requires original disks.